The first thing you'll see when looking at OmniFocus 3 is the new sidebar – in the light mode in particular, it serves as a point of contrast with its dark background, which allows you to focus your attention where it matters: on your tasks. On the far left you have a series of icons which can take you to your inbox, projects list, tags, the Forecast view, flagged tasks, and projects available for review, followed by custom perspectives you have starred – these are limited to OmniFocus 3 Pro users. The next area is the heart of the sidebar; depending on the area of OmniFocus you're in, what's shown in the sidebar will vary – for example, quite logically in the projects view you'll see a list of your projects, and in the tags view, you'll see all of your tags. These include any custom hierarchy you have set up, which is very useful. Perspectives will list tags or projects in this area of the sidebar too, depending on how you have set up your group by options. In the Forecast view you'll find a calendar view of the next month, where clicking each day will take you to the view for that day. The sidebar in the tags view in OmniFocus 3. A custom column view showing the task name, project, tags, defer and due dates, estimated time, notes, and flags. OmniFocus 3 uses the column view by default now, making it even easier to scan your tasks or the tags associated with them quickly. You can enable columns to show you the project, tags, defer date, due date, estimated duration, completion date, the note button, and the flag button. This means if you want all pertinent information on one screen, you can have exactly that; you are able to choose which view and which columns you want to see in each of your custom perspectives as well, if that's what you want. This is very powerful when combined with the power of the new perspectives to give you precisely the information you need, and nothing more. The same tasks above, shown in fluid view. The fluid view is still an option, and it has been updated to let you see multiple tags, each represented in a tag bubble. This look is very familiar to users with the iOS version of OmniFocus, and is my favourite view for very narrow windows as I can still see a lot of information at once – each row does take more vertical space though, which can be at a premium on our displays. 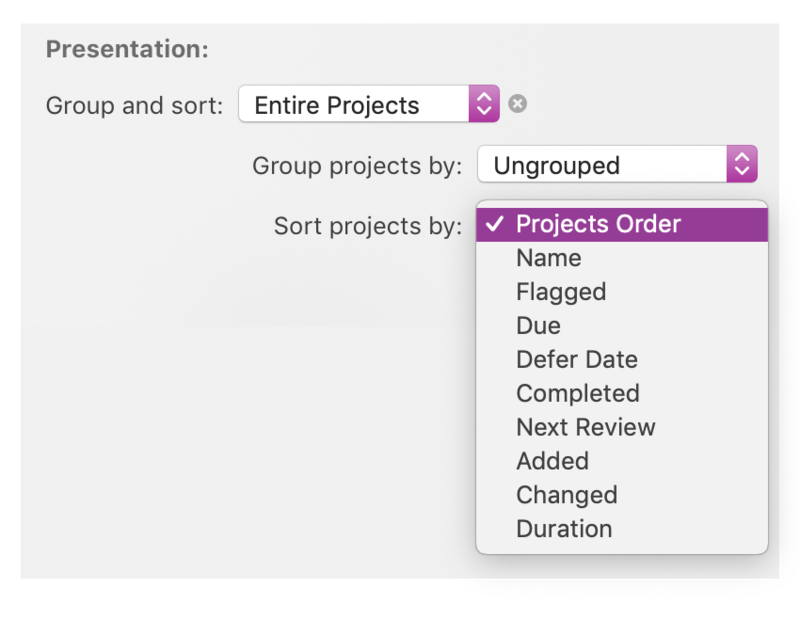 The projects view in OmniFocus for Mac in light and dark mode. 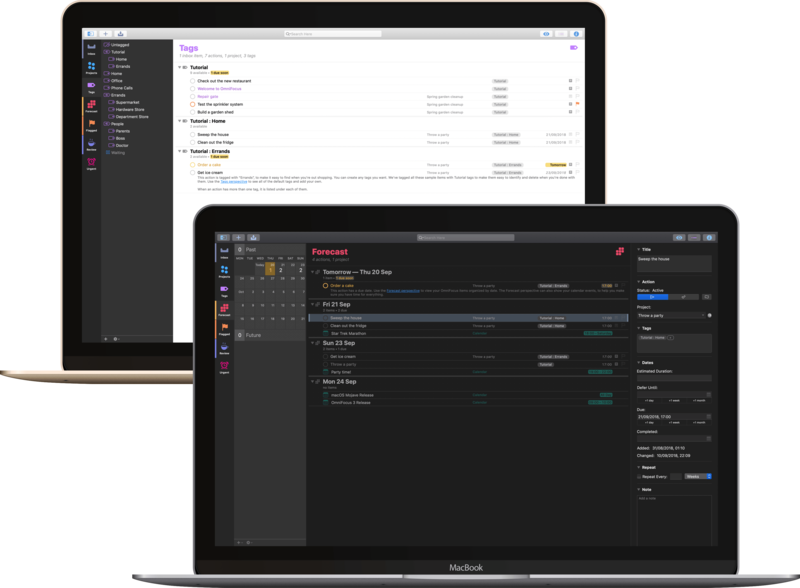 There are just two themes available now in OmniFocus 3, as the Omni Group is focusing on using the system colours which can be selected in macOS Mojave. The two themes included are light and dark, but for each of these themes you can choose to use colour to highlight the titles of tasks which are either due soon, overdue, or the first available in a project. Due soon actions are highlighted in yellow, overdue in red, and the first available task is highlighted in purple. Flagged is highlighted in any view with an orange checkmark circle and an orange flag in the flagged column in the column view. This changes the colour of the task name and can help you to prioritise actions without really thinking about it. If you turn this option off you still retain the coloured checkmark circles, then there is no indication which task is the first available in a project. Single action lists will highlight all available tasks as the first available because there is no priority in a checklist. Using colour in light mode. While the light and the dark themes are created to blend in with the light and the dark system options in Mojave, you set the theme independently of the setting for the OS, which means you can still have a black menu bar and dock with a light OmniFocus if that's what you like. Places tags in the sidebar. In OmniFocus 2 a task could have one context and no more, but in OmniFocus 3 a task may have as many tags as you like, giving you even more ways to slice and dice your tasks at crunch time. I've seen several people trialing energy levels as a tag group, and the Eisenhower Matrix is another example that could be created in several ways. Every tag has the same options as a context did: it can be Active, On Hold, or Dropped. Using tags with an 'On Hold' status is especially helpful for temporary tags to corral your system, for example in crisis times (a tag called "After X"), or just handling the lead up to a vacation. Tags can also be inherited from a project – when creating a new task within a project, it will inherit those tags. This adds more power compared to OmniFocus 2 because you can add these tags to each task instead of replacing the single context. I have found many advantages in using tags rather than contexts. Firstly I moved most of my old contexts under a 'Places' tag, and I added a 'People' tag too. I can now tag tasks I want to complete at the Hardware Store with my boyfriend, so if I happen to be at the hardware store by myself I can see that I wanted my boyfriend there when buying a new shower screen. The people tag also comes in handy in combination with a Waiting On tag. For example if I am waiting on Federico to send me more cute dog pictures before I can move on with my project I can tag the task with both 'Ticci' and 'Waiting On' – so when reviewing either list the task shows up. Energy level and time of day tags. I did briefly experiment with trying to recreate the urgency/importance matrix popularised by Eisenhower, however I see urgent tasks in my Forecast view, and important tasks in my flagged view so this felt like it was creating more work to manage the tags associated with the tasks than strictly necessary – therefore my conclusion is that at least for me I'm best off not using too many tags, otherwise I may increase the work required to maintain my system. 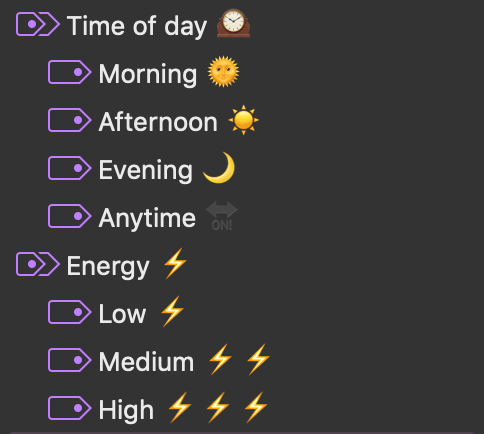 However the energy level tags and time of day tags I have also experimented have actually helped me to complete more tasks. 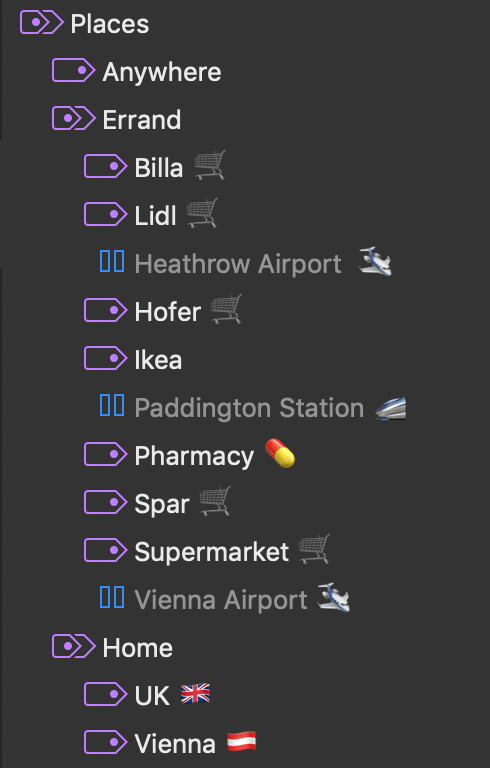 A tip I learnt in the OmniFocus forum has also been to add emoji to my tags – this gives me an easy visual indicator of what the tag is related to, and means in the custom perspectives I can also use the search terms to find all items with a  – which means it has any supermarket tag, general or one for a specific store. The default toolbar in OmniFocus 3. 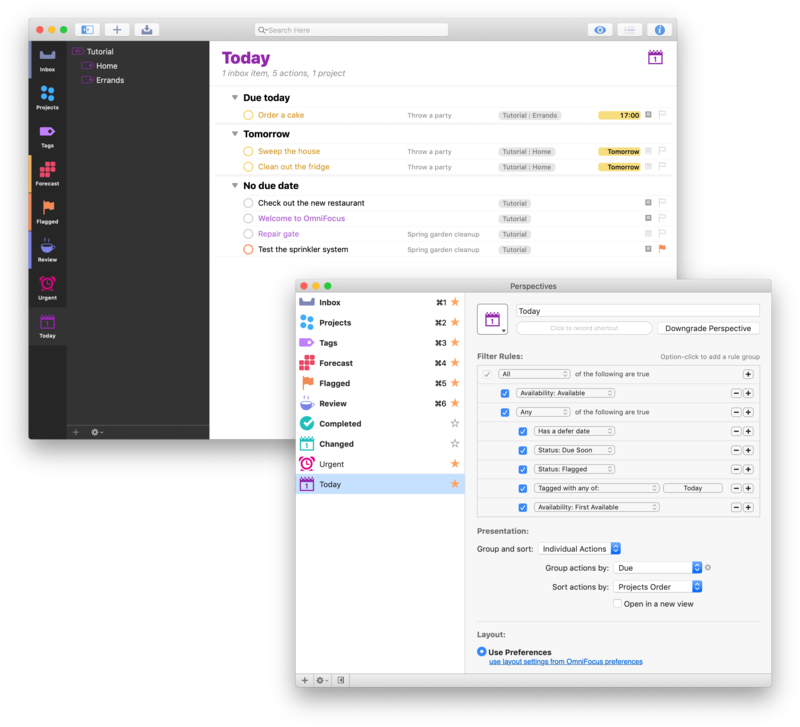 OmniFocus 3 uses a different toolbar style which was introduced in Yosemite and is used in Photos, Notes, Calendar, and Safari. The toolbar is smaller and less intrusive – buttons are all in line with the close/fullscreen/minimise icons which gives you more screen real estate for your tasks. You can still add perspectives to the toolbar (this was briefly removed during the beta in case you have seen a mention of that), and the default set has been slimmed down which I believe will make the application more accessible to new users. It's easy to customise the toolbar too, so if you don't want a search option in the middle, you can easily use the spacing or buttons to put it on one side. Tags in the inspector view. The inspector has also been updated to a more modern look, though you could be forgiven for missing the changes as they're so subtle. The status of a task, active or complete, has switched from dropdown to a segmented control – two buttons next to each other which function like radio buttons, and you may only choose one. The Flag button is to the side of this, just like it was before. The project field has increased in size, which is handy for those of us with longer project names, and the first significant change you see is the tags field. In OmniFocus 2 this was a dropdown because one task had one (or no) context. 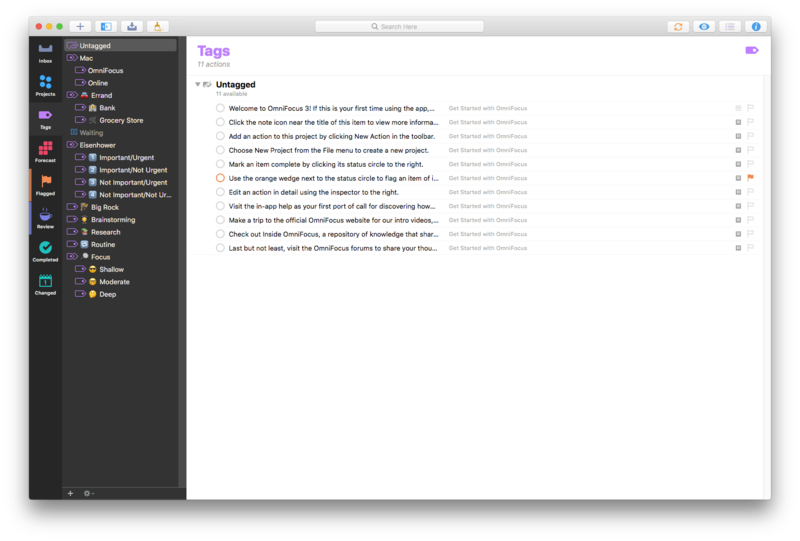 In OmniFocus 3 a task can have an unlimited number of tags, so the field has increased in size and changed to be a token field. Every tag you have applied to a task or project is shown, with the ability to add more. The dates and notes sections have remained virtually unchanged too, and date fields, including estimated time, can still handle parsing of "fuzzy dates", like "3 PM Tuesday". Forecast view with interwoven events. 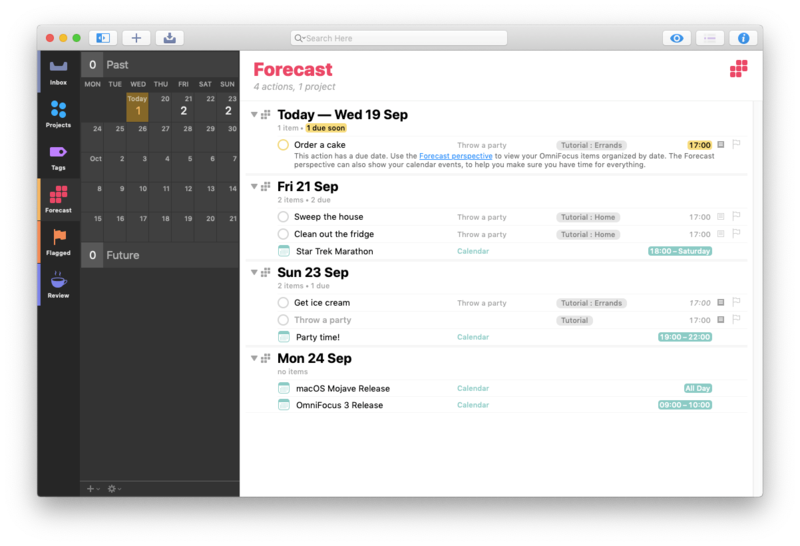 The Forecast view now shows events from your calendar mixed in with the tasks due on the same day. This gives you a way to tell, with a single glance, how busy or flexible your day is going to be. You still see tasks deferred to Today too, prompting you about those tasks which are now available to be completed. You can also add a tag to the Forecast view. Throughout the iOS and Mac beta I've seen this used in many different ways, and because you can choose on each of your devices which tag your forecast tag is, you can use it however it suits you too. One way to use it is to create a Today tag which would be for tasks you intend to do today, but don't want an actual due date attached to. I found I was being too optimistic with the items I wanted to do today, so renamed this tag to 'Next'. You can set different Forecast tags on each device, so you could use 'Errands' on your iPhone, 'Work MacBook' on your work machine, and 'Home' on your home device if you wanted too. 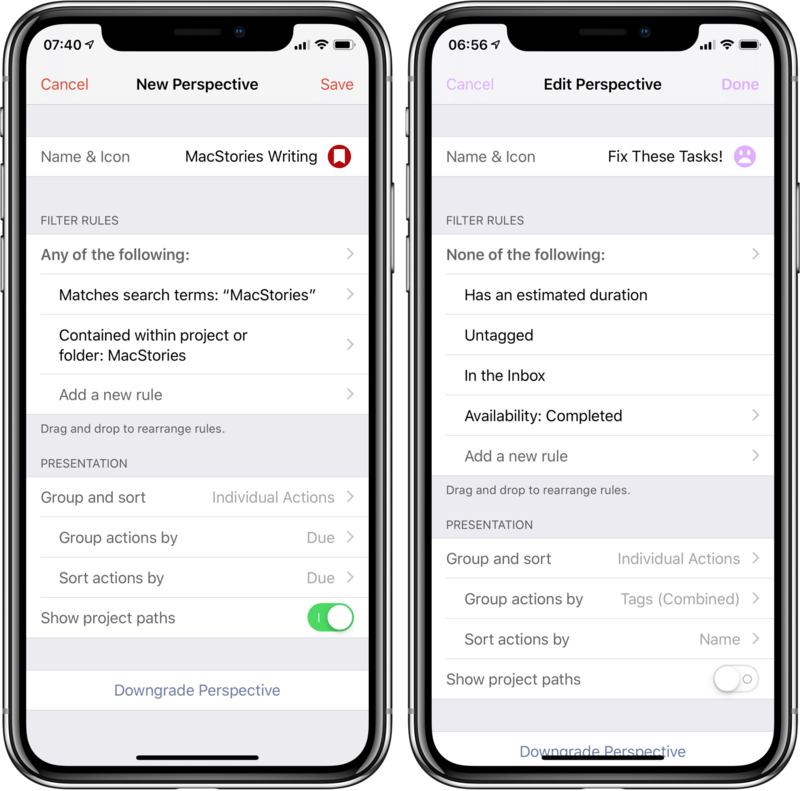 Perspectives are now even more potent than they were in OmniFocus 2, though this shouldn't scare anyone off as you can easily migrate all of your OmniFocus 2 perspectives. Just like in version 2, you can have a massive number of perspectives should you wish, and on each device in the perspectives window you star the ones you would like to see in the sidebar. Alternately, you can also choose to add them to the toolbar. An example Today perspective in OmniFocus. You can now set up an unlimited number of rules, and combine all of these with and, or, and none. If you've ever used Hazel or iTunes Smart Playlists, this system will be familiar to you. At the very top you can set any, all, or none to be the top level rule which everything below falls inside of. Then within this, you could add as many additional rules as you need. By pressing the option key you can add rule groups – again with the same operators and all the same options. Perspective filter rules showing nesting. There are lots of choices for rules, including the availability of a task, its status, it having a due or defer date, estimated duration, or an estimated duration less than 5, 15, 30, or 60 minutes. There are lots of tag options available too, from untagged, to tagged with any or all of, or the task having a tag which is active, on hold, or dropped. Projects are also an option for filtering, and you can specify that you're looking for tasks in the inbox, in a specific project or folder, or by the status of a project, including completed or dropped projects. Finally, you can also build perspectives based around search terms. Tints and icons in OmniFocus 3 Custom Perspectives. In addition to all of those rules and view options for custom perspectives, the Omni Group has more than doubled the number of icons available to choose from for these perspectives, jumping from 30 to now 74 built-in options. In addition to that, there are also 24 colours to choose from, which changes not just the colour of the icon representing the perspective, but also the title of the perspective in OmniFocus. If you combine these, then you now have 1,776 different options to represent your perspectives. 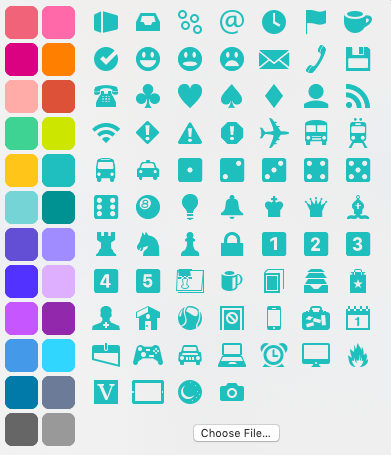 While it's unlikely you will ever run out, there are a variety of custom icon sets out there that you can download too1. The view options have also been enhanced to match the custom perspectives in OmniFocus 3. It is now broken down into 3 levels, 'Group and sort by', 'Group by' and 'Sort by'. This gives you fairly fine grained control over how the tasks are sorted in your perspective. You can group and sort by two options: Entire Projects or Individual actions. This then trickles down into the 'Group By' and 'Sort By' options. Showing the project view options in a custom perspective. Many of the same options are available whether you sort by individual action or by project, allowing you to view all of your tasks in almost any way possible – such as grouped by project name and sorted by due date. There's also a sorting and grouping option available within 'Individual Actions': the ability to sort by combined tags which means you can see all of the unique combinations of your tags with the tasks grouped appropriately underneath them. Depending on the number of tags you use per task this list may contain lots of combinations. You could also group by Tags which does not create these combinations – but if you use more than one tag per task then the task may appear twice in your perspective, depending on your filters. The settings for a perspective with combined tags. How the perspective looks with these settings. Some tasks repeat at what to us humans are regular intervals – the second Monday of the month, for example – but for computers these intervals don't necessarily make sense. 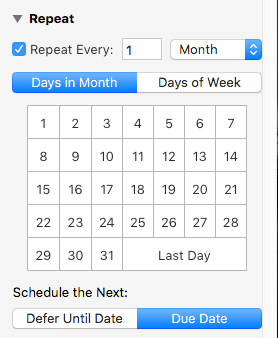 With this update to OmniFocus, however, the app can now understand those types of dates. You can now specify the 1st-5th or "last" in combination with any specific day of the week, or a weekday or weekend day, so you can finally schedule tidying up the shed for the last weekend of the month every month. There's also an option to repeat tasks on specific days in the month – the 13th and the 31st. 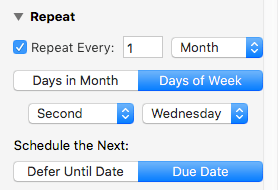 Finally, you can choose to repeat tasks on the last day of the month, which I know many users will enjoy. The Touch Bar in OmniFocus 3 for Mac. OmniFocus 3 adds support for the Touch Bar on compatible MacBook Pros. The options available include adding a new task – either in the current location or to the inbox – adding a new project, adding a tag, notes, review, and cleanup. For fans of the Touch Bar, this is a great addition. The designated tag that can appear below your events and tasks due today in the Forecast view is a premium feature. This tag is definitely helpful to power users who might even want to designate different tags on each device, which is supported by OmniFocus 3. Focus mode is great, enabling you to choose several tags or projects either in the tag or project view, or in a perspective, and when you press the focus button, everything else is hidden. This is perfect for focused work sessions or for those of us who get easily distracted by other, simpler tasks and avoid the hard stuff. For me, the "killer" part of this is that you can switch between views, such as perspectives, and your focus is preserved. With the default view being columns, changing which columns you see to provide you with more information, or switching to the more iOS-like fluid view, is also a pro feature. 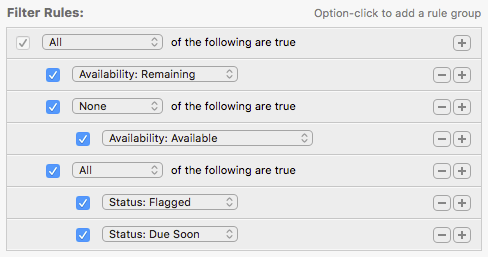 Some perspectives come built into OmniFocus, including Flagged, Completed, and Changed. To create your own, you need to get the Pro version of OmniFocus which will then allow you to create as many simple or complex custom perspectives as you like. The following list of features isn't here yet in 3.0, but the Omni Group has confirmed they are in the works. Multiple notification options for each task, a feature that made a splash on iOS, isn't yet here on the Mac. The Omni Group is taking advantage of Mojave's new notification system and rewriting their implementation. Sadly this means we don't yet have multiple notifications, but the Omni Group is hoping to ship them in an early feature update. The new light mode with a dark sidebar is a bold look, and while many users have warmed to it over the beta testing period, Omni agree that a light sidebar makes sense – we'll be seeing that in the 3.1 update. Sharing tasks is coming, just not yet. When the feature does arrive, it will come in the form of linked tasks rather than exact copies that get synced 100% between users. This will mean if anyone shares a task with me, I can put it in whatever project I like, with the tags I need, and the person who shared will get updated when I complete the task. While not part of the Mac application, the web version has been frequently requested and is also on the roadmap for this year. It's in early beta testing right now and should launch in the not-too-distant future. 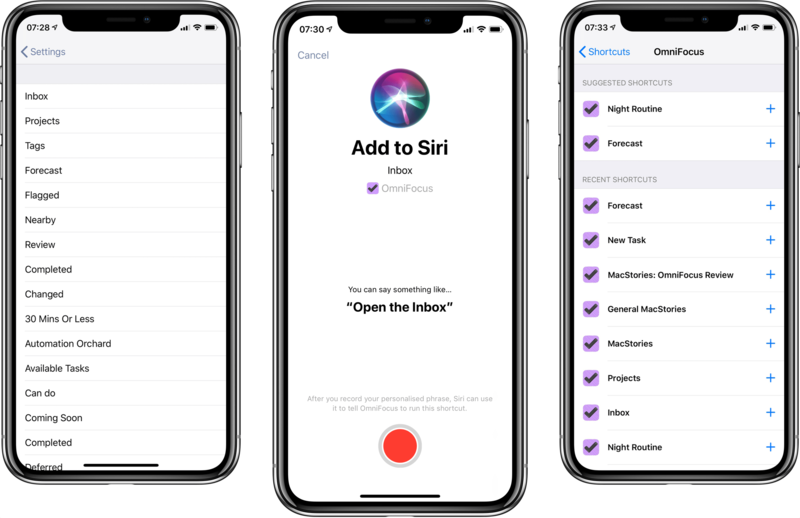 The Omni Group also released OmniFocus 3.1 for iOS this past week, and as you might guess, the release focused on Siri Shortcuts integration. On iOS you have many more options when it comes to Shortcuts. Adding to the options built into the Shortcuts app (add an item to OmniFocus, and add TaskPaper to OmniFocus), which were also built into Workflow, OmniFocus now donates many actions to Siri. Once you've visited the OmniFocus app it will tell Siri about tags you use, projects you visit, perspectives you view, and these are all then available as shortcuts for you to use. Siri Shortcuts in OmniFocus 3.1 for iOS. You can take advantage of these either as standalone actions or inside the Shortcuts app. In the settings area of OmniFocus, under the heading 'Siri', you'll find the 'Shortcuts' menu entry. This also means you will find these items suggested to you on your lock screen, in Search, and in Settings ⇾ Siri & Search when iOS thinks they will be most appropriate to you. 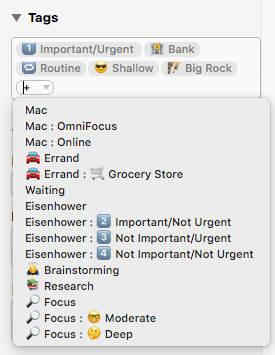 When OmniFocus 3 for iOS released it got the same perspectives as detailed in this article for the Mac. This week it was updated to allow you to change the overall rule for a perspective, so you can create a perspective that starts with Any or None as the overarching rule – as well as All, which is the default. An example iOS perspective with 'Any' as the primary rule. OmniFocus has been my preferred tool for task management for over three years now, and this new version has brought changes wanted by many, while still retaining the look and feel that has captured the hearts of those who already use it. The features many power users crave have increased in strength and flexibility, but are designed in a way so as not to be off-putting to new users or to those who desire a simpler setup. Since the beginning of the iOS beta I have seen what tags vs. contexts have allowed people to do, and used them to enhance my own setup by adding tags for morning, afternoon, and evening to many tasks. The custom perspectives are extremely compelling, and when combined with tags give users the fine grained control we long for. For as long as I've been an OmniFocus user, my use of the app has evolved and changed for the better. This release represents a substantial upgrade that has brought more control to my system and will keep me, and many others, committed OmniFocus users far into the future. OmniFocus 3 for Mac is available from today and is fully compatible with High Sierra and Mojave. OmniFocus 3.1 for iOS was released last Monday and works beautifully on iOS 12 with Siri shortcuts. I look forward to seeing what future updates bring, and the final version of OmniFocus for Web.